Hot box, Warm box or Inorganic cores are more popular today for their low toxic gas emissions during casting, as well as excellent shake out properties. These processes require an external heat source, such as electrical heaters, gas or combustion systems, warm air purge, or a combination thereof. Cure rates can be comparable to cold box, whereas Warm box would be slightly longer to cure and inorganic cores can be shorter or longer cure times, depending on the core. Inorganic cores are hydroscopic and require some specialized storage considerations for long term buffers. 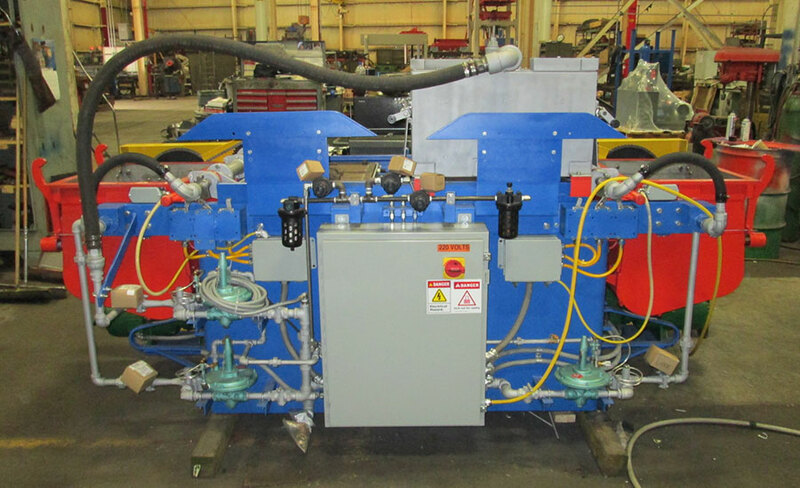 Hot Box or Warm Box core machines are designed for use with an inorganic resin system. These machines follow some basic design principles found in the cold box machines but with a main difference being in the tooling heating system and certain machine cooling processes. Tool heating can be provided by electric heating elements, thermal oil, steam, and gas combustion. The tooling is usually heated to 300 F-400F and a hot air generator can be added to speed up the curing process. The curing is a function of heat delivery system, the core box geometry, and the time required to properly react and cure the core for removal and handling. EMI has the capability to deliver compete hot box core cell systems, including the sand preparation and delivery equipment or smaller lower production – jobbing machines. Our systems are installed in high production – automotive applications and low production – jobbing applications.